Pack size: 60 soft gels per pack. Uniquely-formulated, clinically-proven, health supplements for your eyes, PreserVision Lutein Soft Gels are recommended to maintain your vision especially in later life. Manufactured by Bausch & Lomb, one of the world's leading producers of eye care products, these high-potency vitamin and mineral supplements are especially a welcoming alternative for smokers. 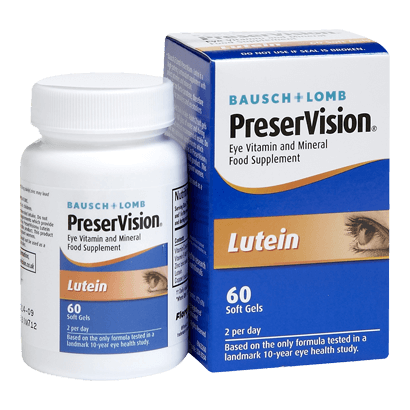 PreserVision Lutein Soft Gels are developed from Bausch & Lomb's exclusive AREDS formula, making the supplements an excellent choice for those who must avoid beta-carotene. Rich in antioxidant vitamins C & E and mineral Zinc, these health supplements are primarily targeted at people aged between 40-60, that are more likely prone to vision disorders as a result of lifestyle and diet factors. Made using high-quality ingredients in strict accordance with the rigorous pharmaceutical standards, PreserVision Lutein Soft Gels will also protect the macula of your eyes from free radicals and toxic chemicals that are formed due to prolonged exposure to UV rays. This is mainly because of an ingredient known as Luetin, which is a member of carotenoid family of plant pigmentation. Although you can find Luetin in leafy green vegetables, you might not be able to consume them every day. Whereas, these supplements come in a convenient capsule form, allowing you to take them on the go. To yield maximum benefits, it is recommended that you take two doses per day. Each pack contains 60 soft gels and will last for a month.